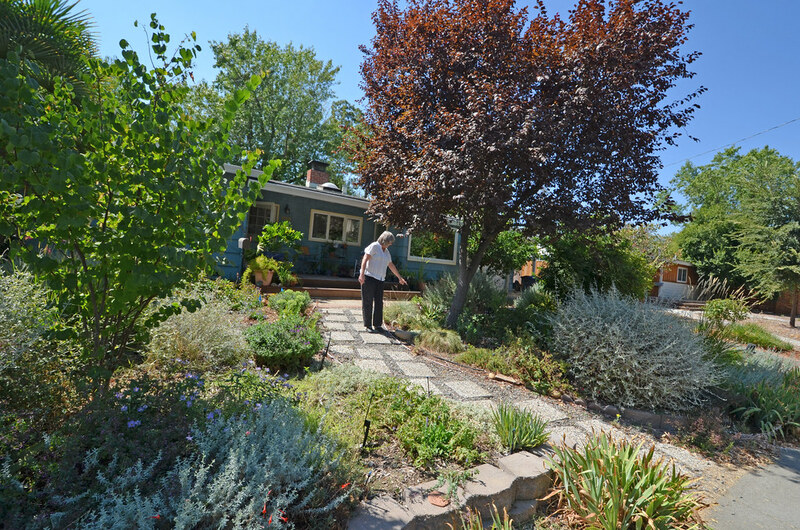 While most yards are mainly either full sun or full shade, the loss of a mature street tree provided Ellen a chance to have both sun-loving and shady plantings next to each other, an opportunity she takes full advantage of to attract more beneficial pollinators. To create this pollinator paradise, Ellen uses Frikart’s aster (Aster × frikartii ‘Mönch’), Cascade Creek California goldenrod (Solidago californica ‘Cascade Creek’) and purple oregano (Origanum ‘Hopley’s Purple’). Not only do their blooms provide summer color, they attract a mix of white, yellow and orange butterflies. Next her goal is to add more larval food plants for caterpillars like passion flower (Passiflora‘Blue Bouquet’).